Me: Are you serious? I’m about to see my fourth Broadway show, and it happens to be Wicked! Wicked opened on Broadway on October 30, 2003, and while I remember reading a review of the show in Time magazine, I wasn’t really aware of the show until the spring of 2004. Our choir director announced that they had chosen “For Good” to be our varsity show choir’s ballad for next year (my senior year), and surprise, surprise, we were not the only ones. Nearly every choir chose “For Good” as their ballad. It was guaranteed that at every major show choir competition across the United States, there were one or two choirs singing “For Good” as part of their set. I was in our school’s junior varsity show choir, so I never performed “For Good” as part of high school choir, but members of the JV show choir attended all of the varsity show choir’s performances to show our support. As my senior year went on, that song became inextricably attached to my memories of that year. The song is obviously about friendship, the pain of saying goodbye to an old friend, and moving on to the next stage of one’s life. I had chosen to attend school out of state, and I was also the only person from my senior class to choose this particular school. Sure, I would see my old friends over the holidays, but essentially, I would have no immediate connections to my old life in Iowa. To this day, I still get sappy about “For Good” and Wicked in general. With all that in mind, I was seeing Wicked in the summer of 2005, right after my high school graduation. This show already had special meaning for me, and I think I was really at the right age to fall in love with the show. The first half of the show is a mismatched college roommates comedy, and then just before the intermission, it becomes the story of a young woman finding her voice and speaking out against a perceived injustice, even when it costs her everything. It is a coming-of-age story for both Elphaba and Glinda, and Winnie Holzman’s book is brilliant because Elphaba is not the only sympathetic character. Glinda could have been this shallow queen bee, but she has a lot of love for Elphaba. Even Nessarose is sympathetic in her own way, and her obsession with Boq is understandable, though obviously unhealthy. When I saw Wicked, there were only two principal members of the original Broadway cast left in the show, Michelle Federer as Nessarose and William Youmans as Doctor Dillamond. Principal actors who were not members of the original cast are in bold. Looking over the cast list, I am stunned at the abundance of talent in one show. Megan Hilty (Smash, Gentlemen Prefer Blondes) was making her Broadway debut as Glinda. She had just taken over for Jennifer Laura Thompson a few months prior, and she would go on to be nominated for Broadway.com’s Audience Award for Favorite Female Replacement. Shoshana Bean is almost as synonymous with Elphaba as Idina Menzel, playing the role on Broadway through January 2006 and then joining the show’s 1st national tour. Rue McClanahan pretty much needs no introduction. She is a legend thanks to Golden Girls, and I remember borrowing Nunsense from our public library on many, many occasions. Ben Vereen is kind of in the same boat. Ben Vereen is magic. The names Jeffrey Kuhn and Phillip Spaeth didn’t really mean much to me in the summer of 2005 (Sorry, guys! ), but they sure do now! Fans of the web series Submissions Only will recognize Jeffrey Kuhn as Andy Edmond, Penny’s irritable music director on Jeremy’s Fort, and Matilda fans will recognize Phillip Spaeth as Mrs. Wormwood’s “part-Italian” dance partner, Rudolpho. Spaeth was also making his Broadway debut in Wicked, so here is yet another case of me getting to see these great acting talents in their first Broadway roles! I don’t have many other notes at this point, since the articles are the same for all the other Playbills from this trip to New York. 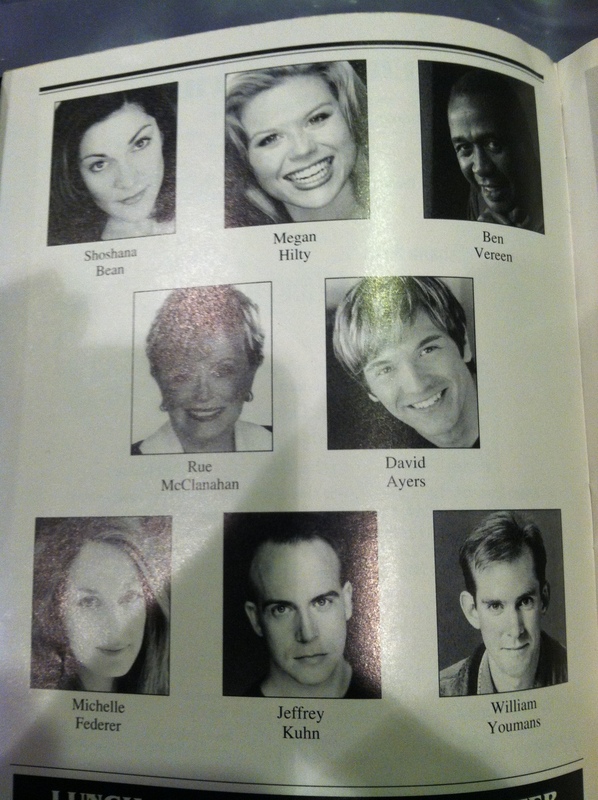 I did want to include a picture of the central cast page, though. Look at all this talent! Wow, I cannot get over how lucky I was to see so many talented actors in a show that I already adored. A Streetcar Named Desire (Starring Natasha Richardson and John C. Reilly), After the Night and the Music, All Shook Up, Avenue Q, Beauty and the Beast, Brooklyn, Chicago, Chitty Chitty Bang Bang, Dirty Rotten Scoundrels, Doubt, Fiddler on the Roof, Glengarry Glen Ross (Starring Alan Alda, Liev Schreiber, Frederick Weller, Tom Wopat, Gordon Clapp, and Jeffrey Tambor), Hairspray, Jackie Mason Freshly Squeezed, La Cage Aux Folles, Lennon, Little Women, Mamma Mia!, Movin’ Out, On Golden Pond (Starring James Earl Jones and Leslie Uggams), Rent, Spamalot, 25th Annual Putnam County Spelling Bee, Steel Magnolias, Sweet Charity, The Constant Wife, The Glass Menagerie (Starring Jessica Lange, Josh Lucas, Sarah Paulson, and Christian Slater), The Light in the Piazza, The Lion King, The Phantom of the Opera, The Pillowman (Starring Billy Crudup and Jeff Goldblum), The Producers, and Who’s Afraid of Virginia Woolf? (Starring Kathleen Turner and Bill Irwin).